Photo, top right: Jessie and her sister, Mary Ann, pose for a picture! Jessie comes back to camp each year to honor Mary Ann and to give back to the patients and siblings in our care. "Friends of Santa Claus has been a part of my life for a long time. I started as a camper at Camp Merry Times, and now I'm a counselor. Sometimes being a sibling can be tough. Not only do you have to watch them while they are sick, but sometimes it makes you feel alone. That's another reason camp made me feel special. 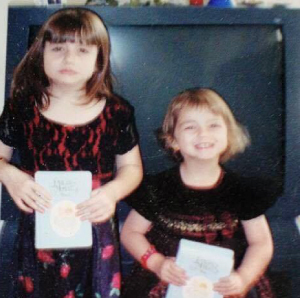 My sister was always so cheerful for the condition she was in. She also got to go to camp one year and she loved it! I remember having to go through McDonalds and order 200 chicken nuggets for the weekend, because that's all she would eat! Camp also allowed us a weekend to bond, celebrating fun times with each other and making memories. The group made me feel like a part of things and that I was not alone. It melts my heart to see all the good they do for families going through what mine did as a child. And I hope to change lives as they did for me." "Volunteering my time with FOSC-- as a counselor and through marketing/design initiatives-- has allowed me to use my talents to impact the lives of others. That is so rare these days, and I feel grateful to be able to use my creativity and excitement to make these families' lives better. I look forward to camp each year, counting down the days until we get there just like the campers do. As counselors, we get to be silly, but we also get to encourage campers to try new things and meet them where they are. I always leave camp exhausted and so full of joy. It is the privilege of my life to be a part of Friends of Santa Claus. This organization is truly something very special to me and to the families we serve." "The past five days have been nothing but amazing. I met some amazing new friends. I feel very blessed to have had the opportunity to meet them. Some of the kids have been diagnosed with cancer and the other kids were siblings of those that have cancer. These days spent at camp have gotten me thinking and made my emotions jump around. It's crazy how you go into a volunteer opportunity thinking 'how can I serve others,' but you end up getting the better end of the deal. These are the experiences that change lives (including mine!)" "When I was first introduced to Camp Merry Times and the FOSC organization, I had absolutely no idea what I was getting in to. I started out with the camp as the 'tennis chick,' and frankly had no idea that the camp was for children with cancer and their siblings. I was such a spoiled teenager at the time and that first year of camp truly changed my life! I am beyond grateful for the many years that I've been able to spend time with some of the most incredible people on earth, and I count the days until the next camp!! There are not enough words to describe the love I have for this organization and all of the people that make it what it is!"